Centrist bloc could win 24 seats, new survey reveals - and oust Sephardic hareidi parties entirely. 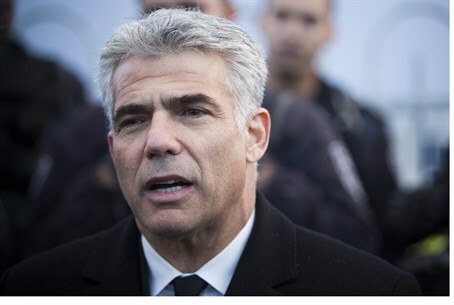 A joint list between Yair Lapid's Yesh Atid party and Moshe Kahlon's Kulanu could drastically change the face of the Knesset, according to a new survey released Wednesday. The poll, published in Haaretz, presents two scenarios: one with a Lapid-Kahlon joint list, and one without. In the event of a joint list, Lapid and Kahlon would gain the biggest number of seats: 24 mandates - leaving Likud behind with just 21. Meanwhile, Tzipi Livni's and Yitzhak Herzog's Hatnua-Labor pact would gain 20 seats in the Knesset, according to the poll, with Jewish Home placing fourth at 16 seats. The Arab parties would gain fifteen seats, with five each to United Arab List, Balad, and Arab-communist party Hadash; hareidi party United Torah Judaism would gain nine seats; Avigdor Liberman's Yisrael Beytenu, eight seats; and Meretz would gain six seats. Interestingly, the pact would displace both Sephardic hareidi parties - Shas and MK Eli Yishai's new Yachad party - entirely from the Knesset. Each would only gain three seats, and neither would pass the Knesset threshold of 3.5%. The poll presented a separate set of results in the event Lapid and Kahlon do not create a centrist bloc, which would see Labor and Likud fighting neck to neck to secure a coalition. Both Labor and Likud would gain 21 Knesset seats, according to that scenario, followed by Jewish Home at 16 seats and Yesh Atid with 11 seats. Yisrael Beytenu and UTJ would each gain eight seats. Both the Arab parties and Meretz would remain with fifteen and six seats, respectively; meanwhile, in a crucial change for the Sephardic hareidi bloc, Shas would scrape past the threshold with four seats - but Yachad would still fall just short of the threshold at 3 seats. Shas's electorate power has been split in half since Yishai introduced Yachad earlier this week, both polls reveal, and the split has also been reflected in a Knesset Channel survey published Tuesday. That poll projected that Shas and Yachad would each garner just 4 seats in the 20th Knesset, down from projections of 8-9 seats for a united Shas. Concerns over how a split within a smaller voting bloc could affect the composition of a future coalition have heightened during this round of elections for the national-religious bloc as well, as talks continue to stall between Jewish Home and its Tekuma faction.